B vitamins are an essential part of your diet because they enable your body to turn the foods you eat into energy. You also need a steady supply of B vitamins to make red blood cells. 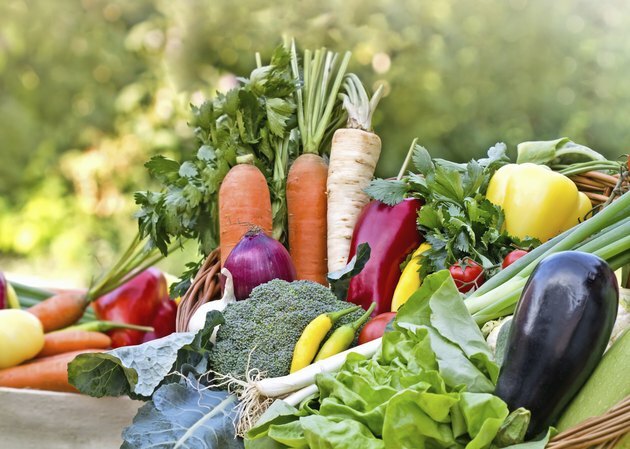 Healthy supplies of most of the eight B vitamins are present in a variety of vegetables, and adding these vegetables to your diet will help you meet your B-complex vitamin needs, as well as other key nutrients such as potassium and fiber. Folate, also called folic acid or vitamin B-9, is essential in DNA and RNA formation and can help prevent birth defects. Healthy adults need 400 micrograms of folate each day. Cooked spinach is a good source of folate with 131 micrograms per 1/2-cup serving, which is about one-third of what you need for the day. Four spears of boiled asparagus contain 89 micrograms of folate, and a 1/2 cup of frozen, boiled brussels sprouts has 78 micrograms. Lettuce, avocado, mustard greens and peas are additional vegetable sources of folate. Thiamin, or vitamin B-1, helps provide energy to your brain and central nervous system. Men need 1.2 milligrams a day, and women require 1.1 milligrams. A cup of boiled split peas has 0.37 milligram, or 31 percent of what men need each day. It's 34 percent of what women should have daily. Beans, Jerusalem artichokes, lima beans, iceberg lettuce, spinach and beet greens supply trace amounts of thiamin. Riboflavin, also called vitamin B-2, plays a crucial role in growth and red blood cell production. To support these functions, men need 1.3 milligrams a day, and women require 1.1 milligrams daily. A cup of boiled spinach contains about 0.43 milligram, or one-third of what men need each day and 39 percent of women should have daily. Mushrooms, broccoli, brussels sprouts and potatoes supply trace amounts, as well. Niacin, also known as vitamin B-3, supports the normal function of your skin, nerves and digestion system. Men need 16 milligrams of niacin each day, and women should aim for 14 milligrams. A baked potato supplies 2.8 milligrams, or 18 percent of what men need daily and 20 percent of what women should have each day. Peas, sweet potatoes, asparagus, corn and artichokes supply small amounts as well. Healthy adults under the age of 50 need a daily supply of 1.3 milligrams of vitamin B-6, which is necessary for brain function and hemoglobin production. One cup of boiled potatoes, with 0.4 milligram, supplies 31 percent of that amount. One-half cup of baked winter squash delivers 0.2 milligram of vitamin B-6, and 1/2 cup of frozen, boiled spinach provides 0.1 milligram. You need 2.4 micrograms of vitamin B-12 per day to support red blood cell production and brain function. Vegetables aren't a good source of vitamin B-12, but you'll get a trace amount in raw white mushrooms, which contain 0.03 milligram per cup. Pantothenic acid, or vitamin B-5, helps your body make energy from food and supports the production of melatonin, a hormone that plays a role in normal sleep-wake cycles. Adults need 5 milligrams of pantothenic acid each day. One-half cup of cooked broccoli supplies 0.48 milligram, which is almost 10 percent of this daily requirement. Avocados, sweet potatoes and mushrooms also supply pantothenic acid. Biotin, also known as vitamin B-7, aids in cell growth and energy production. There is no recommended daily intake for biotin, but the adequate intake level is 30 micrograms per day for healthy adults. Avocados and cauliflower are vegetable sources of biotin.